Georges-Marie-Julien Girardot (French, b. Besançon 1856 - d. Paris, 1914) "Avant la Noce" (Before the Wedding) A Large and Impressive French 19th Century Oil on Canvas depicting a joyous patio scene preparing for a wedding celebration, a young maiden defeathering a goose, another setting the plates at the table which is centered with the wedding cake, and older maind cooking in the background while another receiving the delivery of food from a local merchant, two gentlemen retrieving the wine from the basement cellar. 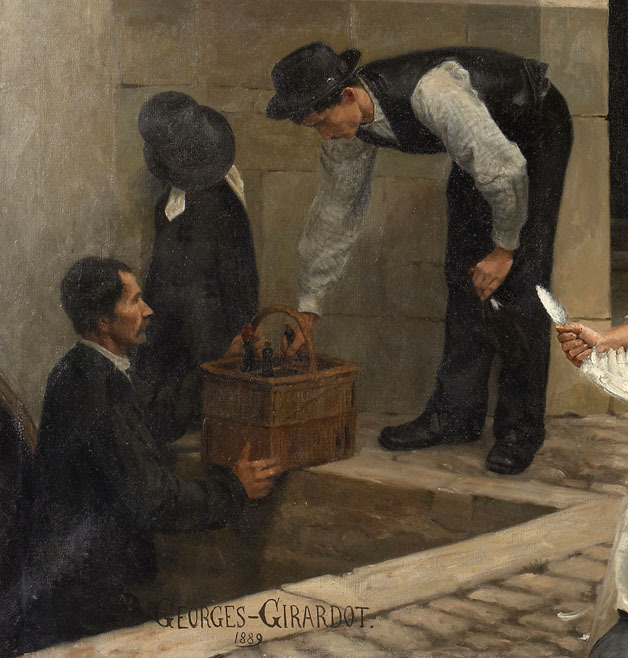 From the artist: "La scène est representée dans la cour de la maison Granvelle â Pesmes" (The scene takes place in the courtyard of the Maison Granville in Pesmes, France). Signed and dated (lower left) "GEORGES-GIRARDOT / 1889". Circa: Paris, 1889. 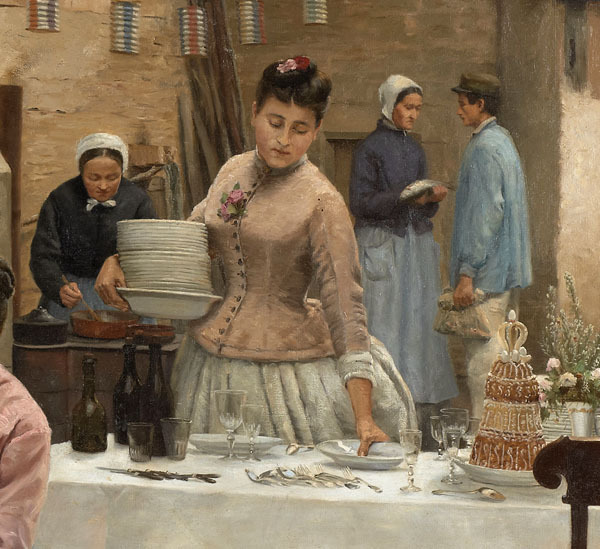 Exhibited at The Salon in Paris of 1889, n° 1144, Titled "Avant le mariage" (Before the Wedding). 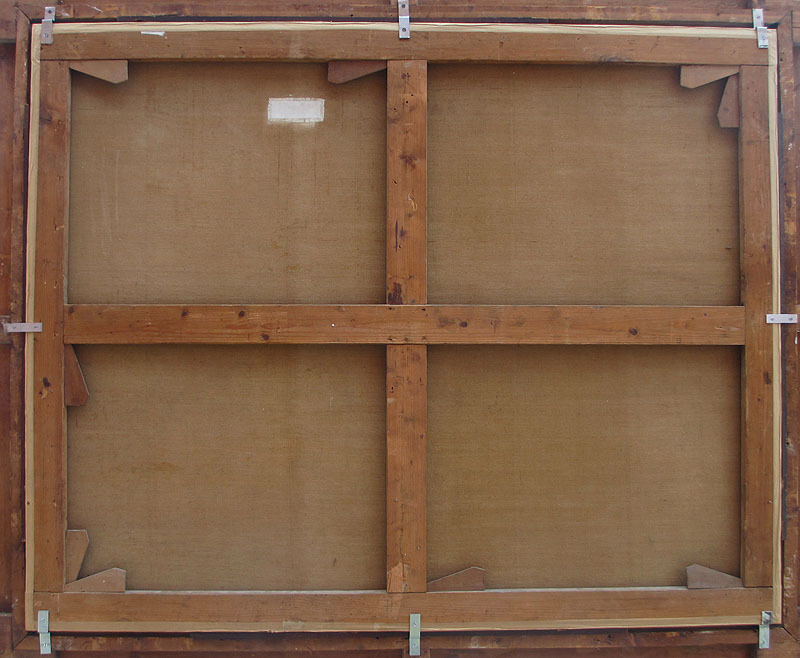 Provenance: Former property of the artist's family private collection. An old label on the back of the frame reads: "Argelliés Doreur Sur Bois - Encadrements, Dorure et Glaces de toutes grandeurs - Paris - 73, Rue de Rennes. 73 - Ci-Devant Rue du Dragon, 31 - Faubourg Sait-Germain". An oil on canvas titled "Les Reverences a la Lune" (Crepuscule) by Georges Marie Julien Girardot painted in 1890 was sold at Sotheby's Paris on June 25, 2008, Sale PF8031, Lot 123 for € 66,750 EUR ($103,923 USD or £52,827 GBP). 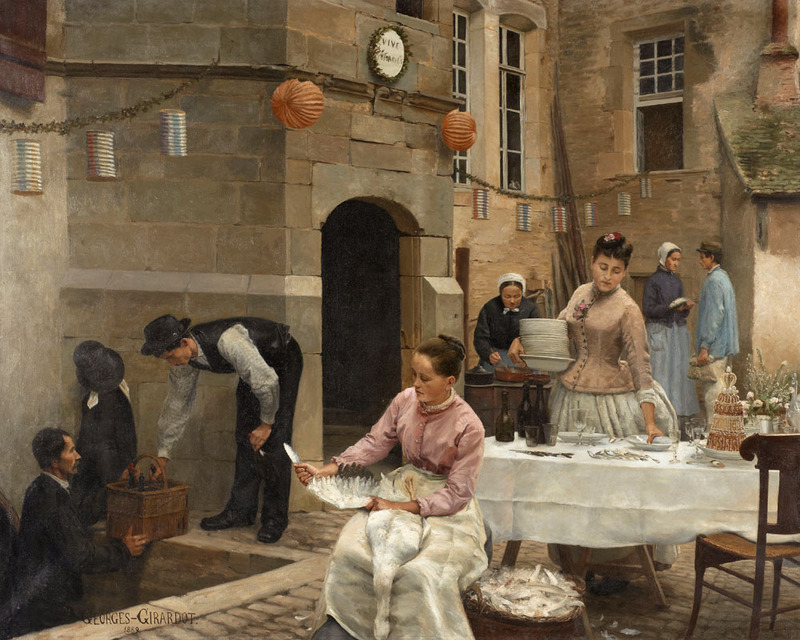 Click here to view an image of Girardot's "Les Reverences a la Lune"
Georges-Marie-Julien Girardot (French, b. Besançon 1856 - d. Paris, 1914) "Avant le Mariage" (Before the Wedding) A Large and Impressive French 19th Century Oil on Canvas depicting a joyous patio scene preparing for a wedding celebration, a young maiden defeathering a goose, another setting the plates at the table which is centered with the wedding cake, and older maind cooking in the background while another receiving the delivery of food from a local merchant, two gentlemen retrieving the wine from the basement cellar. 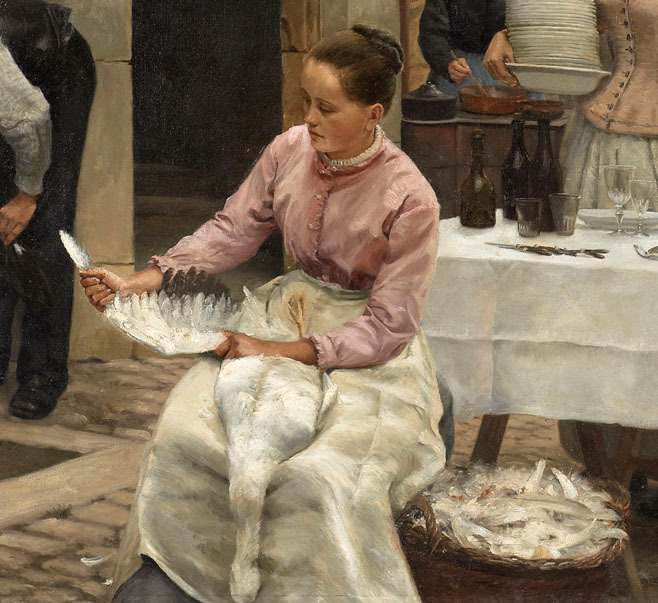 From the artist: "La scène est representée dans la cour de la maison Granvelle â Pesmes" (The scene takes place in the courtyard of the Maison Granville in Pesmes, France). Signed and dated (lower left) "GEORGES-GIRARDOT / 1889". Circa: Paris, 1889. 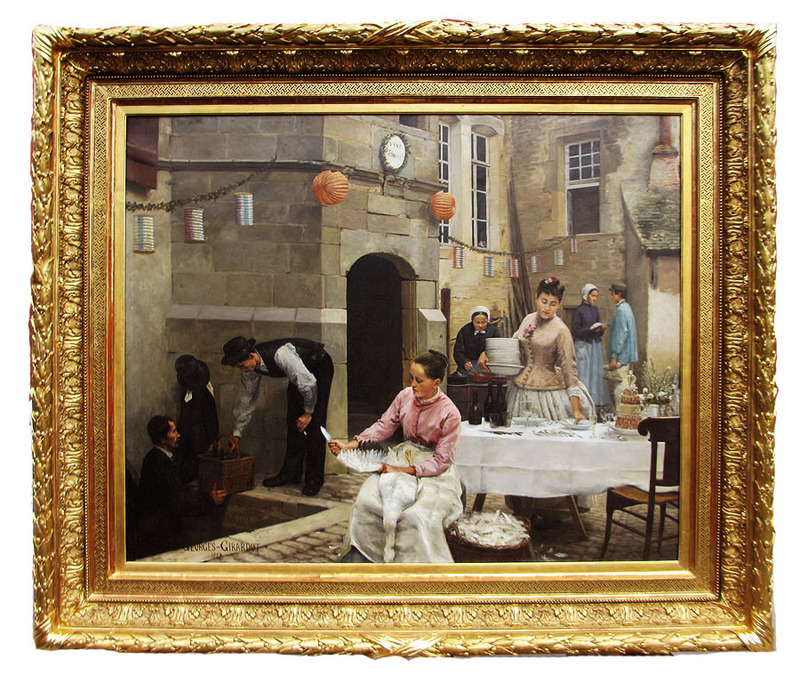 Exhibited at The Salon in Paris of 1889, n° 1144, Titled "Avant la Noce"
Provenance: Former property of the artist's family private collection. 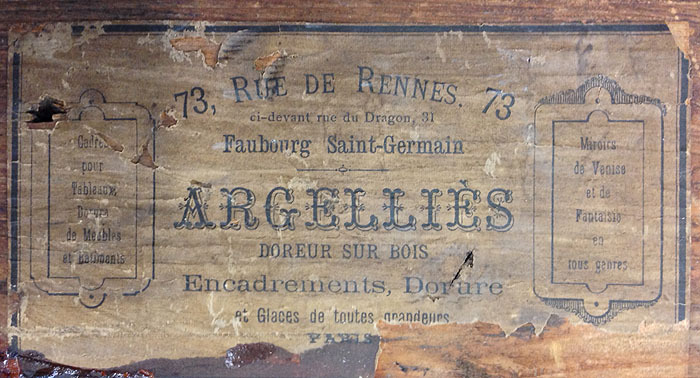 An old label on the back of the frame reads: "Argelliés Doreur Sur Bois - Encadrements, Dorure et Glaces de toutes grandeurs - Paris - 73, Rue de Rennes. 73 - Ci-Devant Rue du Dragon, 31 - Faubourg Sait-Germain"
An oil on canvas titled "Les Reverences a la Lune" (Crepuscule) by Georges Marie Julien Girardot painted in 1890 was sold at Sotheby's Paris on June 25, 2008, Sale PF8031, Lot 123 for € 66,750 EUR ($103,923 USD or £52,827 GBP). Click here to view an image of Girardot's "Les Reverences a la Lune".